Once a gene has been located and cloned, genetic engineers usually need to modify it so that it expresses in a specific and desired way when inserted into the plant. The modification involves changing the sequences in the regions of the gene that control gene expression. Genes have three regions, the promoter, coding region, and termination sequence. The promoter turns the gene on. The coding region has the protein building information, and the termination sequence indicates the end of a gene. The promoter and the coding region are the gene regions that are normally modified. Using special DNA modifying enzymes, geneticists can cut apart the gene regions, remove one of them, and replace it with another that will direct gene expression as desired. The gene is then considered recombinant DNA since it has a new combination of DNA. This part of the genetic engineering process can be very time consuming but also gives the genetic engineer a wide array of gene design options to try. The first region of a gene is the promoter. It acts as a 'genetic dimmer switch' in that it turns the gene on and off and specifies how many copies of the protein will be produced. Two main promoters currently used in transgenic crops are the 35S promoter and the PEP carboxylase promoter. Each promoter is turned on differently in plants. The 35S promoter originated from a cauliflower mosaic virus gene. This particular gene is continuously needed in every cell of a plant and its promoter turns on the gene in every cell of a plant that is metabolically active. Therefore, when genetic engineers use this promoter in a transgene, the protein encoded by the gene will be produced in every cell all of the time until the cell dies. The phosphoenolpyruvate (PEP) carboxylase promoter is from a plant gene encoding a photosynthetic enzyme. As a result, any transgene with this promoter will produce the protein only in cells that are actively making photosynthetic proteins. Genetic engineers use this promoter to limit gene expression to cells that make up green tissue. This would not include root, tassel, or ear tissue. Expression also begins to slow and eventually stop toward the end of the season when the plant is completing its lifecycle and photosynthesizing less. A good example of these two promoters in action is in Bt corn. Some Bt hybrids are designed to have resistance to European corn borer all season long in every part of the plant. Those lines have a transgene with the 35S promoter. Other Bt hybrids are designed to have resistance only in green tissue but not in other parts of the plant, such as the seed or roots. These lines contain a transgene with the PEP carboxylase promoter. These plants also have reduced resistance later in the growing season. The second region of a gene that is also often modified in transgenes is the coding region. This region contains the coded information, which designates the amino acid sequence of the protein to be produced. The amino acid sequence of the protein determines its shape and thus the function of that protein. During protein production, a complimentary copy of the coding region called mRNA is made which travels from the nucleus (where the immobile DNA is located) to the cytoplasm (where the amino acids for building proteins are located). Many Bt genes have been cloned that have the potential to provide resistance to ECB and other insect pests. Three coding regions for ECB resistance have been used in commercial Bt corn; Cry 1A(b), Cry 1A(c), and the Cry 9c. Each region encodes crystaline proteins in the bacteria that are responsible for insect larvae toxicity. When eaten by the European corn borer, these crystaline, or Cry proteins, bind to the insects' midgut causing those cells to burst from a water imbalance killing the corn borer. Transgenic plants containing a Bt gene produce these Cry proteins, which the ECB ingest when feeding on the plants. There are hundreds of naturally occurring Bt proteins each with their own coding regions. However, not all are toxic to ECB. The nucleotide sequences of the Cry 1A(b) and Cry 1A(c) coding regions are very similar. The slight differences are not enough to cause a difference in protein toxicity. The nucleotide sequence of the Cry 9C coding region, on the other hand, is different enough that it produces a protein that is toxic to European corn borer, but binds to a different site in the midgut killing the corn borer larvae in a slightly different way. Therefore even if ECB become resistant to the Cry 1A(b) and Cry 1A(c) proteins they may still be susceptible to the Cry 9(c) protein. This technique has potential for dealing with the development of insect resistance to the toxin. However, it is not a �silver bullet�. It is possible that when ECB develops resistance to one Bt protein, it will also develop resistance to other Bt proteins. This is called cross-resistance. The alterations of coding regions to avoid resistance requires an understanding of how the insecticidal proteins interact with the insect on a biochemical level. 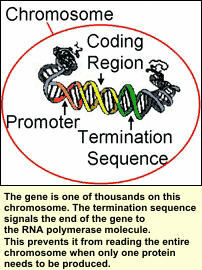 The termination sequence, which follows the promoter and coding region, is the last region of the gene. This region is not typically modified significantly to alter gene expression. However, during protein production it signals the end of the gene so the entire chromosome is not read. This would result in the expression of other genes and the production of their proteins which may not be needed. For example, human finger cells have eyeball genes in them, however they do not produce all of the eyeball proteins because they are not needed in your fingers. Finger cells only make proteins needed by the fingers. Want to learn more about gene regions? Want to learn about gene constructs?